How can I tell if a Steam game syncs my saved games to the Steam Cloud? I've already seen this question and this one, but neither explicitly tells me whether a particular game syncs saved game files to the Steam Cloud. Do all Steam games with Steam Cloud enabled automatically sync your saved games? Are there some games that don't? How can I tell which are which? I ask because I'm about to go on a bloodthirsty purge of my locally-installed Steam games, and I don't want to lose my saves. The Steam Cloud seems like a perfect option (redownload the game, get all your saves back at the same time), but I don't want to accidentally delete a game and then later discover "Oh, by the way, we didn't sync your saves, but we did sync your graphics preferences! Ha ha!" If you display your library in List View, there is an optional Steam Cloud column which displays a cloud icon if a game supports saving to the Steam Cloud. Regarding whether games sync saves or just preference files and the like: there's no way to tell for certain besides checking the descriptions or asking other players / the developers. However, the vast majority of Steam Cloud - supporting games, at least from my experience, will sync both saves and user preferences. In fact, I haven't heard of any instance where only preferences were synced to the Steam Cloud, except multiplayer games without local save files. The Steam game hub discussions for each game might be a good place to ask other players if you can't find the information elsewhere. 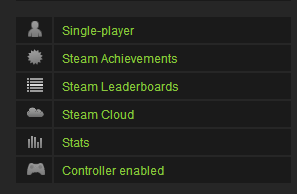 In the sidebar in a game's store page you can find this kind of information about what Steam features a game supports. Once in this folder check out the contents of the remote folder. This is where the files synced to steamcloud are stored. You may be able to identify what information is being synced by the contents of this folder. For example, UnEpic has the following. It appears this game saves your savegame files, configuration, and another unkown file. Orcs must die! has the icon of a cloud and the phrase "Steam Cloud". If you go to your library and enble the List View, you can then Right-Click on a game with the cloud icon, under Properties -> Updates, you will see a check box to sync 'your experience'. There is also a check box under Settings --> Cloud. Not the answer you're looking for? Browse other questions tagged steam steam-cloud or ask your own question. Where are my Saved Games kept, and can I back them up? What games save to the Steam Cloud? How much available space per game in the Steam Cloud? Can I get my saved data back later if I uninstall a steam game? How do I remove a Steam game from my library? Do Origin Cloud saves work properly with Steam? Skyrim - Crashed Hard disk lost all local saves, steam cloud backed up nothing? Can Steam tell me when I have a game installed on another computer or in another OS? Is there a way to force Steam Cloud to sync? Do non-cloud Steam save files have a regular structure? How to get Steam to recognise previous game files from The Witcher 3? How can I get my Steam Cloud saves without installing the game?